Getty Images North America via ABC/Kevork Djansezian/AMA2018Mariah Carey, Missy Elliott and Dallas Austin are among the nominees for induction into the Songwriters Hall of Fame this June. Missy is the first female rapper to be nominated, and she was thrilled with the news. “I am Humbly Grateful to be nominated with so many other AMAZING writers Congratulations to all of them,” she commented on social media. Two male rappers have already been inducted into the Songwriters Hall of Fame: JAY-Z and Jermaine Dupri. 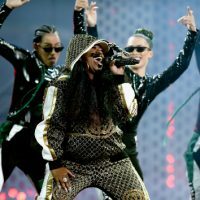 Missy’s solo hits include her platinum singles “Get ur Freak On,” “Work It,” “Hot Boyz,” and “WTF.” She’s also written for numerous stars, including Carey, Aaliyah, Whitney Houston, Beyoncé, Destiny’s Child, Mary J. Blige, TLC and Jennifer Hudson. Austin began his career writing for TLC, including their 1992 debut platinum single, “Ain’t 2 Proud 2 Beg.” He’s also composed songs for Michael Jackson, Aretha Franklin, Lionel Richie, Janet Jackson, Boyz II Men, Chris Brown, Monica, George Clinton and Madonna. A songwriter qualifies for induction 20 years after the first commercial release of a song. The nominees are split among “Performing Songwriters,” such as Missy and Mariah, and behind-the-scenes “Songwriters” like Austin. The voting will continue through December 17 and the finalists will be inducted during a gala ceremony on June 13 in New York City.